Brook House Farm is 4.5 acres of flat land on the Fylde plain near Garstang, just north of Preston. The soil is a silty, clay loam, fertile, but slow to drain in an area of high rainfall. 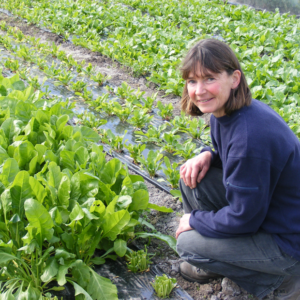 The farm is owned by Libby and Paul Flintoff, who took on the smallholding in 1993 after growing organically in Yorkshire for 6 years. The land had to go through the conversion period and during this time the couple carried out a lot of conservation work, planting trees and hedgerows, laying existing hedges and digging out a pond. The first organic crops were produced in 1996 and sold to a local box scheme. Gradually, over the years, the area of protected cropping has increased to the point now where the farm boasts 15 polytunnels covering an area of 2100 square metres. In addition to the original box scheme, Brook House supplies Unicorn and a few other outlets in the Manchester area. Crops supplied to Unicorn include peppers, aubergines, spinach and French beans, but the Flintoffs also grow spring cabbage, onions, tomatoes, beetroot and cavolo nero.